Boise State's Derrick Alston shoots against San Jose State Saturday Feb. 9 2019 at Taco Bell Arena in Boise, ID. Alston scored 33 points in a 105-57 Broncos victory. It’s been a difficult season for Boise State, with hopes of a winning season hanging by a thread. But the Broncos insist it is not over, and they point to Saturday’s game as evidence. BOISE, Idaho — Monday, February 11, 2019. First, Alex Hobbs hit a three-pointer. Then Marcus Dickinson made a three. Then Justinian Jessup. And then Derrick Alston. 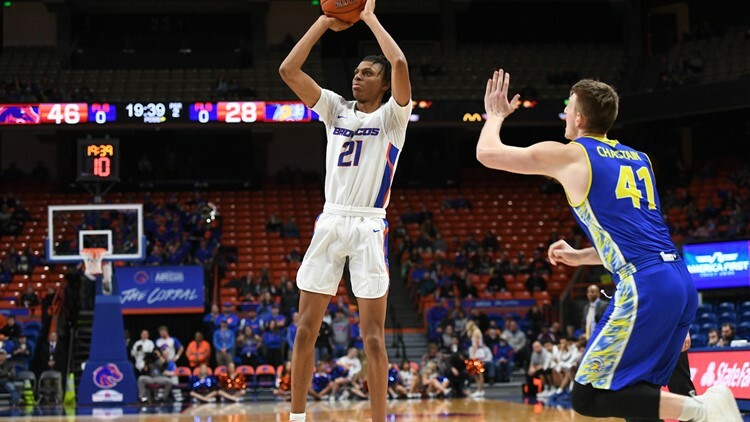 When Alston drained a second trey, Boise State was up 15-0 and was off to the races in 105-57 romp over San Jose State Saturday afternoon in Taco Bell Arena. Alston was just getting started, as he poured in a career-high 33 points. He was about as efficient as you can get, going 12-for-15 from the field, 5-for-7 from three-point land and 4-for-4 from the free throw line. All in 28 minutes. It was Alston’s second 30-point game of the season. Keep in mind this is a guy who played a grand total of 26 minutes last season and scored seven points. It was the perfect tonic for the disappointing home loss to UNLV last Wednesday. And it had everybody scrambling for the record book. It was not only the Broncos’ second-biggest margin of victory in a conference game in program history and their first 100-point game since the 2017-18 season opener, it was also their highest-scoring game in eight seasons of Mountain West play and their most points versus a conference opponent since beating New Mexico State 107-102 in triple-overtime in the 2008 WAC championship game. And it was Boise State’s most points in regulation in a conference game in 44 years—since a 105-92 victory over Montana State in Big Sky play in 1975. Players always dream of being the face of the program when they graduate to college basketball. This is not what Jaycson Bereal had in mind, though. Bereal’s mug shot made the rounds on social media Sunday after an early-morning arrest in the 6th & Main bar district. Bereal, a 6-6 guard from Tulsa, OK, who’s redshirting at Boise State, was charged with battery and loitering-minor misdemeanors. Bereal is one of five Bronco freshmen redshirts this season. Coach Leon Rice told the Idaho Press he’d have information on Bereal’s status today. Boise State linebacker Curtis Weaver (yes, he’s now called a linebacker) spent the weekend in Columbus, OH, where he was honored at the 64th Touchdown Club of Columbus Awards Saturday night. Weaver was named one of seven FBS “players to watch” on defense for 2019. The junior from Long Beach, CA, is a two-time first-team All-Mountain West selection. Weaver led the conference in sacks as a freshman with 11 and was second last year with 9.5. Another season like that may make him the Broncos’ next early entry into the NFL Draft. Also honored as “players to watch” were quarterback Jordan Love and linebacker David Woodward of Utah State and running back Ronnie Rivers of Fresno State. No introduction necessary for that latter guy. Another player to watch locally is David Moa, who was almost like a new signee on National Letter of Intent Day last week, according to Boise State defensive coordinator Andy Avalos. That’s how excited the Broncos are to get his senior year back via an NCAA injury waiver and get him on the field again this year. And not just because of the 56 career tackles and 11.5 sacks be brings with him. “Just as a person and a leader,” said Avalos. “Excited to help him keep growing as a young man—just what he brings to the building.” Moa has been active and enthusiastic on Twitter, indicating that he’s counting down to the start of spring football. The Idaho Steelheads are now looking up at first place in the ECHL Mountain Division. After a three-game sweep of the Steelheads, the Utah Grizzlies have opened up a four-point lead in standings over Idaho. The Grizzlies beat the Steelies 4-3 Friday and 4-2 Saturday, with goalies Tomas Sholl and Ryan Faragher each taking a loss. This marks the Steelheads’ first three-game losing streak since November. No Riley Lupfer—no matter for the Boise State women Saturday at San Jose State. With Lupfer home healing a minor injury, the Broncos roared out to an 18-0 start, although the Spartans did make a game of it (unlike their men’s counterparts in Boise), even leading by six points at one time in the third quarter. But Boise State had too much, as Braydey Hodgins and A’Shanti Coleman keyed the rally that gave the Broncos separation in an 83-69 victory. Hodgins notched her second straight 20-point game, draining five three-pointers. Boise State retains sole possession of first place in the Mountain West with a 10-1 record (19-3 overall). Gibson Berryhill had a 34-point weekend as the College of Idaho men moved within shouting distance of the Cascade Conference regular season title. Berryhill put up a career-high 22 points in a 108-93 win over Multnomah Friday night. The Coyotes then downed Warner Pacific 78-68 Saturday on Senior Night in Caldwell. Elsewhere, the Northwest Nazarene men broke a six-game losing streak at Western Washington by beating the Vikings 90-79 Saturday night. The Nighthawks are still locked in a tight race for the GNAC regular season crown. And the NNU women, ranked No. 7 in Division II, cruised past Seattle Pacific 90-71 in the snowy Emerald City Saturday to improve to 21-1. To no one’s surprise, Boise State officially scrapped plans to have a new on-campus stadium ready when baseball is resurrected in 2020. Hopefully the Broncos’ relationship with the Boise Hawks’ brass is good, because Memorial Stadium is perfectly suitable as a temporary venue. The Boise State women’s gymnastics team beat Utah State Friday night in Logan, with Shani Remme grabbing the 20th all-around victory of her career. And at the Husky Classic in Seattle, both Allie Ostrander of Boise State and Jessica Hull of Oregon easily topped the best women’s collegiate indoor 3,000-meters time of the season Friday. Hull got the win over Ostrander, who’s mark of 8:55.26 will likely get her into the NCAA Championships. The Cleveland Cavaliers break an NBA record 26-game losing streak by beating the Los Angeles Clippers 126-119 in overtime. In their first season without superstar LeBron James, the Cavs had been positively awful. But five days after ending the streak they would take down the two-time defending NBA champion L.A. Lakers, improving Cleveland’s record to 10-46. Just a season earlier the Cavaliers had compiled the league’s best record at 61-21.